You want your offer to be accepted but what if there are multiple offers on the table? How do your offers stack up to the others and how can you make it stand out. 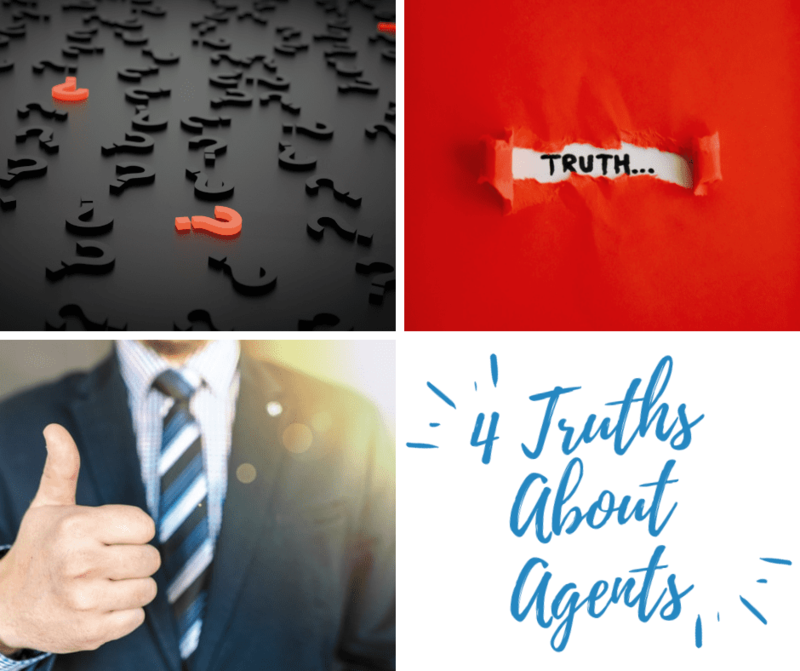 Because we worked with buyers for decades we know key negotiating strategies that will help our buyer’s offer get accepted, but there are some tricks of the trade. 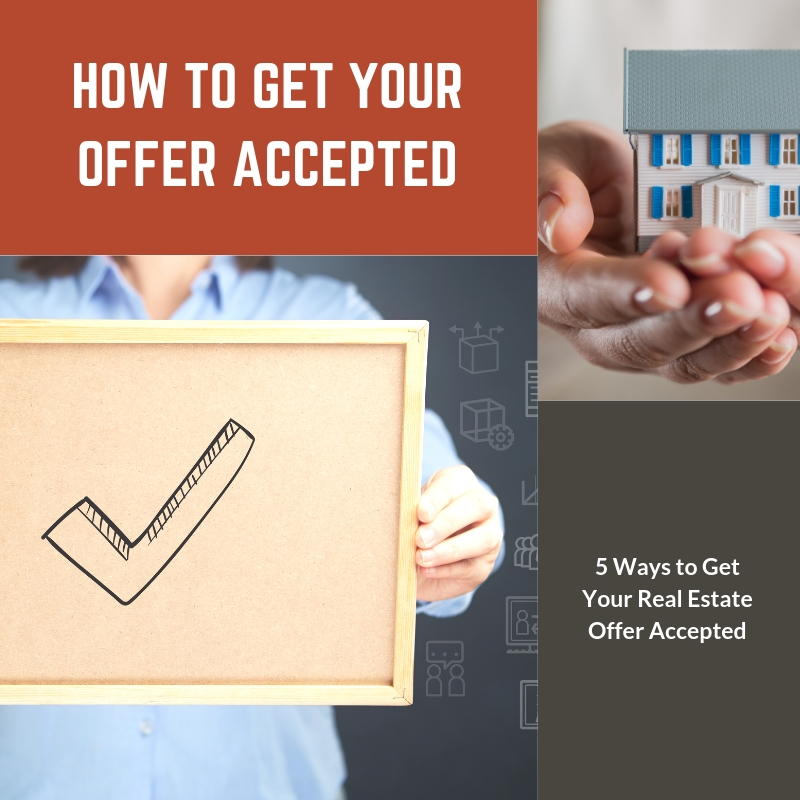 Here are five ways you can get your real estate offer accepted. Anyone can technically make an offer on a property but if you don’t know all of the legal jargon and real estate terms, you could be missing out on how to write up a solid and tight offer. Always have your own agent representing you, the buyer, when submitting an offer. Make sure your offer is first. Some sellers will hold off accepting offers just in case they might get more offers. However, being the earlybird can have benefits. Try to ask your agent to get in an offer early and always be the first one. Sellers technically have the upper hand in a multiple offer situation so the price isn’t the only thing that will get your offer accepted. Minimal contingencies can also be very attractive. While we don’t highly recommend waving home inspection, it can entice sellers to accept your offer knowing that there are minimal things standing in the way from you buying the home. Sellers are more likely to review your offer if it is over the asking price. You have to be careful, though, because you want the home to appraise for the inflated asking price. If you are in a hot market, writing an offer over the asking price you feel the deal for the seller. Agents have long since touted the benefit of writing a letter to the seller but this isn’t always a good idea. We had a seller who received seven offers in two weeks, five of them had letters and they ended up going with the offer that didn’t provide a letter. So it depends on the seller. Having your buyer’s agent talk to the listing agent may make this tactic more clear. Again, working with a seasoned and experienced real estate agent on how to write up a solid and tight offer is really the key to getting your offer noticed and accepted. 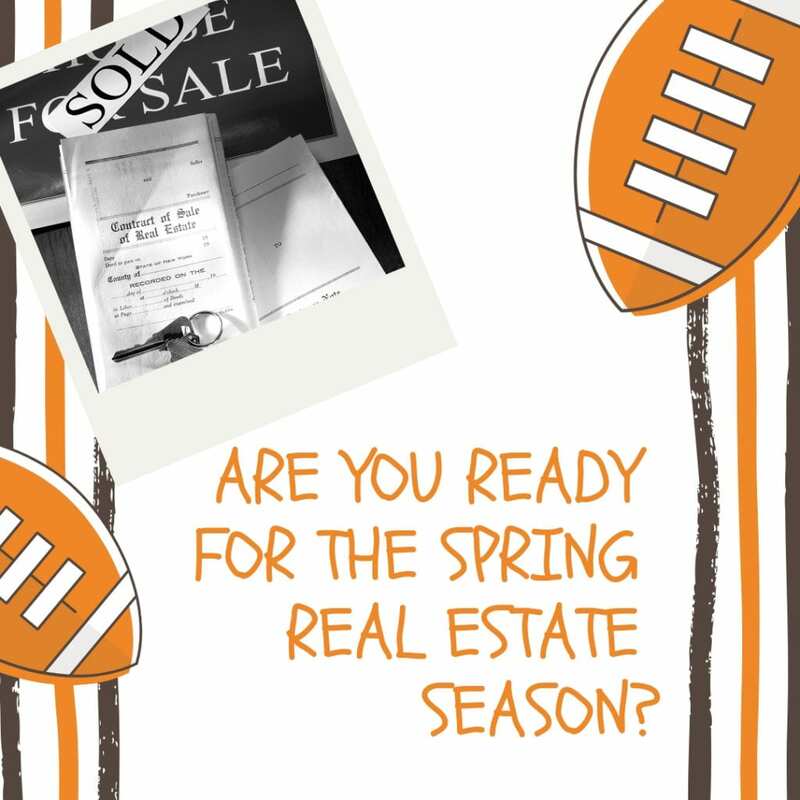 Whether you are a Patriots fan or a Rams fan, Super Bowl is happening this Sunday, February 3 and it is unofficially the start of the home buying season. Although with the weather around the country, spring seems like light years away, actually, it’s right around the corner and many feel that the Super Bowl Sunday is the major kickoff to the spring home-buying season. Many homebuyers that have been delaying looking at homes or jumping on the ball of the lender situation will now be in full swing come Monday morning. So what does this mean for buyers and sellers right now? As a seller, if your home is already listed on the market don’t be surprised by an influx of showings or interest starting next week. We are seeing some of the more milder temperatures around the country, not like some of our northern states hit with this polar vortex. Because of that, more buyers are willing to venture out and see homes, start conversations with their lender, and get in touch with a buyers agent in their area. But, this also means that buyers will have more competition. Because there will be more buyers on the market you’ll see some competition, but I don’t think it will be a competition like we saw last year at this time. The market, while still balanced in a lot of places, is not as hot as it was just a year or two ago. Homes are sitting on the market a little bit longer, which means that buyers have a bit of an advantage. Although we’re not quite into a buyers market, depending on the neighborhood or community, you may have a little bit more time to decide whether the home is right for you. However, newer listings will have more competition than older ones. But, this might be a great time to consider offering a lower price for homes that have been on the market for longer than three months. If you’ve been holding off listing your property, now might be a perfect time. Again, will have more buyers on the market, and you’ll probably get more activity over the next couple of weeks than you would have the previous two weeks. Home prices are steadily rising, so you might be able to get more for your house now than a couple of years ago, but the demand won’t be as strong. The biggest thing to do when considering buying a home next to vacant land is to ask questions! And ask a lot! This will protect you from ugly surprises. Find out who owns the land, find out the zoning of the land, and the approved use of the land. Do it before you buy. Why Ask These Questions? What Could Happen? 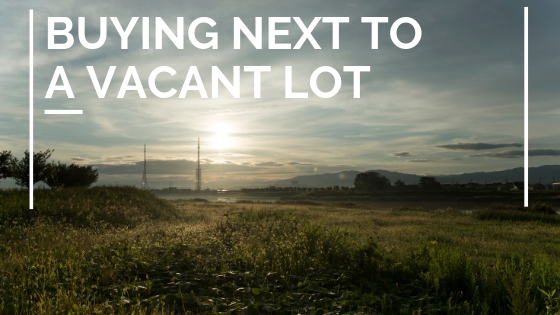 – Does your new home have a gorgeous view of the location of the vacant land? Well, that view could eventually get blocked by the building of new homes. – Do you like your new home because of the quiet area it’s located at? Well, that vacant land you’re next to could one day become a very busy road or a huge shopping center. – Does your new home have a huge yard? Well, is it because you don’t know where the property lines are? Because if so, the owner of the vacant lot next to yours may soon take over. Buying a home is an emotional process and it’s easy to get caught up in the excitement of it all. 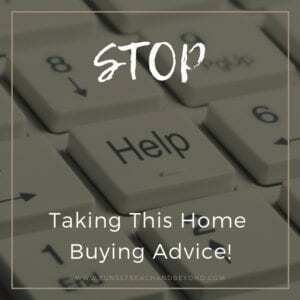 No matter what your experience with home buying is, you should stay the ground during it all. This is especially true when it comes time to make the offer and during the inspection. Additionally, don’t rely on the information of one person alone. Do your research to YOUR satisfaction. In a lot of cases, researching a property or vacant property may be as simple as reviewing county records online to see who owns it and what it’s zoned for. If that’s not good enough, then ask other homeowners in the area what they know. Regardless of what you actually do to research a property or how you do it, make sure you take into consideration all the potential possibilities before you purchase a home next to vacant land. I know we’re not even quite into winter yet but the temperatures are getting a little bit chilly at night and we know it’s only a matter of time before those first few snowflakes fall. Whether you are an investor, first-time homebuyer, or just looking for your next big deal, buying a home in the winter is actually a great time to find a super bargain. Many top experts agreed that the winter season is one of the best times to buy a home if you don’t want to pay top dollar. Of course, in places like Florida and Southern California, these deals may not work, but in places where we get a little bit of chilly weather or snow, bargains are to be had just about everywhere. Here are some tips to buying in the winter. Just because you are looking for a deal doesn’t mean the sellers want you to have one. It’s important to have a great buyers agent on your side that negotiates on your behalf. This is not the time to Oooo and Awe over a home saying you must absolutely have it. Sellers sense that and usually won’t budge on the price. Keep your cards close to you and never insult the seller. Allowing your real estate agent to guide the process and negotiate on your behalf is really the best way to find a great deal. Be ready at a moments notice. Although there is not that many buyers on the market as in the spring and summer, you still have to be ready to jump on a great deal. Be flexible, not only with your real estate agent but with the sellers as well. You might need to see a home in the morning, afternoon, or evening to get that great deal. Find an agent that is winter-savvy. Because we have bought and sold property throughout southern North Carolina for decades, we have the know-how and the skills to help you negotiate for the best price this time of year. Winter sellers are very different than spring and summer sellers and you have to know how to communicate with them. If you keep the end goal in mind, buying a great home at a great price, then you won’t let the small stuff get to you. You may lose out on a home but realize that the point is to try and get a good deal, not pay top dollar for any home. Let’s talk about your needs, what you’re looking for in a home, and your price range and find exactly what you’re looking for at a great price.